Potato Stuffed Chapathi | Simple and Delicious ! I think most of you are in a holiday mood! Do your kids really enjoy holidays? How do they spend time there? My kids don't have much holidays this time, only four days they got, that too including sunday! I think that is enough, otherwise I see them bored of Tv and computer games. 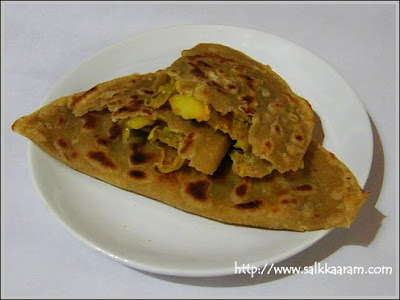 Nowadays it is not easy to see some children playing outside, even during this vacation time, but see some 'bored youngsters' spending time in the drawing rooms - eating, drinking in front of the Tv..
Now you have the recipe for aloo parotta, try preparing it for the kids.The potato masala you usually prepare for Masala Dosa will be enough for making this. Hope you all will love this, enjoy! Heat oil, allow mustard seeds to splutter in that. After a while add chopped onion and saute until transparent. Add chopped green chillies and ginger and stir until the aroma comes. Put chopped tomato and all the powders, salt ,coriander and curry leaves. Stir well until the tomato is mashed. Add the mashed potatoes into this and mix well. Use a mixture of maida and atta for this. Take one chappathi and spread 2 Tb spoons of masala over the half part of it. Fold the other part over this. Join the edges by pressing slowly with fingers. Heat a frying pan, pour little ghee in it. 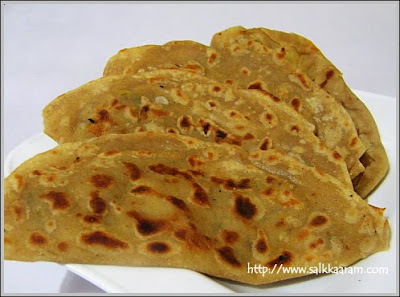 Place the above chappathi over it. Pour little ghee over the other part. When one part is cooked and turns little golden, turn over it. Cook the other part too like that. You should flip over it occasionally. Looks very tasty, the pics are very tempting too. one of my fave breads :) wishing you happy holidays! looks delicious.. i love anything with potato filling..